Some wondered why Vrabel didn’t give the ball to 6-foot-3, 247-pound running back Derrick Henry in that situation. The fact that Tennessee’s defense allowed the huge run by Miller seconds after the failed fourth-down attempt was just another disappointment for the Titans. 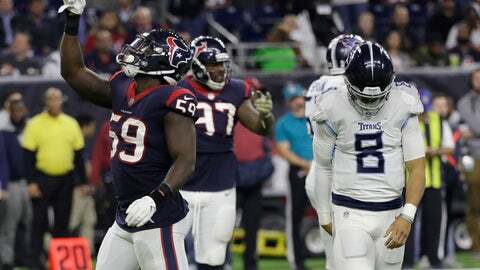 Vrabel couldn’t celebrate Mariota’s effectiveness on a night when the Titans allowed the Texans to set a franchise record with 281 yards rushing, led by 162 from Miller.